The city of Tehuacan is famous for its springs, they have transcended as a healthy way to the region to currently marketed mineral water drinks because big names such as water means health are attributed healing properties to the human body . captured the commercial world to the existence of several soft drink companies that produce and sell mineral products. Among the major companies are Peñafiel, Garci Crespo, San Lorenzo, irrigation, and Blue Label Balseca. It is important to know that refresqueros products for years sold had the name "Tehuacan" printed on their bottles (because the mineral water used for processing come from that place), however since the British bought some soft drink brands, since 1992 they decided to remove the word "Tehuacan" labels the base plates of Peñafiel products. Likewise, it is also essential to know that others of the most recognized brands of soft drinks mineral water is Garci Crespo and San Lorenzo, whose property is the Mexican Business Group "GEMEX" and for years they continued to report on their television commercials that mineral water Garci Crespo It was bottled in Tehuacan. Unfortunately Garci Crespo stopped working in 2002. It is powered by an underground stream that is created from thawing Pico de Orizaba in Veracruz. The springs are famous for their healing and revitalizing water through mineral waters. It is important to note that the source of Peñafiel is not open to the public. It is a place where there is a spring that is open to the public and has guided tour by a tour operator who will speak about the importance of conservation and care of the springs is in Tehuacan, and also enjoy the public beach there in that place whose pools are mineral waters. This place is dedicated to the Immaculate Conception and Cave. The cathedral is a building with beautiful details that make it a place of peace, striking and where many people fit. Its construction began in 1724 and ended in 1728. The materials used in its construction were stone and adobe. Has great towers of Renaissance style, its interior is a Latin cross and the image of the Immaculate Conception, patroness of the city. It also has a dome of talavera that has drawn the four representative shields of the region such as the papal, nocturnal adoration, the city of Tehuacan and Bishop Rafael Ayala and Ayala. If you visit the city of Tehuacan be sure to know a majestic place filled with elegant and eye-catching details. Then contact so you know where the Cathedral of Tehuacan is presented. The former convent of Carmen has a Mexican Baroque architecture that was very typical of the eighteenth century. It is one story but inside is very spacious with roofs made of wood, roof and Franciscan life and have style. The former convent was popular many years ago because of all the events that happened in it. It is said that initially worked as a prison, after the railway concession was concluded that place was used as a barracks that housed the 26th Cavalry Battalion and 37 Infantry Battalion. Currently the former convent is a place they can visit to admire the beauty of its construction and is also interesting for those who like history. This building was transformed over time and the rectory and offices of the Municipality was built there as well as the library was built Tehuacan. Since many years ago the inhabitants of Tehuacan wanted to have the Franciscan monks because they had to go elsewhere to have contact with them in other temples and monasteries. That was how in 1536 a church and convent was built in the red hill of Tehuacan. It notes that where created what today is Tehuacan, in the past it was elsewhere but had to relocate because they had problems with pests and ants rattlesnakes. Later around 1569 and 1570 an earthquake caused the Tehuacan definitive change to its current location. The construction of the convent was completed in the sixteenth century beside the temple or church of San Francisco. Inside it has decorative religious elements that give great views throughout. The interior garden has 16 Tuscan columns and arches. On the main altar is a statue of St. Francis of Assisi, on the shelves there are sculptures of San Antonio de Papua, Santo Domingo, San Agustin, San Ignacio and San Felipe de Jesus, who said that the latter was the first Mexican saint. If you want to know and admire the former convent of San Francisco should only go to the center of the city of Tehuacan and quickly know which building is. Calvary was built for economic resources Joaquín del Moral because the people of Tehuacan refused to cooperate, but wanted an ordeal. The situation was in his favor when Joaquin decided to build the ordeal, it should be noted that this was not part of the federal government because it was private property of Mr. aforementioned.It is said that the ordeal was built in 1759 and the first stone was blessed by Juan Felipe Cardona who was the priest of San Antonio Cañada. In 1760 the bishop of Puebla Dongo Pantaleon Alvarez de Abreu Joaquin granted the patronage of the ordeal and was also given the authority he had successors. In the area of ​​Calvary three chapels whose material was used limestone quarry and adobe were built. They had a baroque style and all three were very similar. It is a building dating from the nineteenth century and was the first two-story building was in Tehuacan. In 1855 it became the place where were the municipal powers. City Hall has a Moorish style and inside there is a large mural where you can view pictures through the evolution of the city and its five regions since pre-Hispanic times to the present. The creators of the mural was Luis, Rutilio and Santiago Carpinteyro. It is also another wall where the drawings of the most important historical figures of the city of Tehuacan are. Its creator was Fernando Ramirez Osorio. Do not forget that City Hall is a place where you take into account the free will, free religious belief, freedom of thought is given and the relationship between the authorities and the people is so friendly always trying to cater to everyone requiring the resolution of an issue or problem. The general facade of City Hall at one end and the public clock on the other sides have sculptures of national heroes. It has a kiosk that is where musical performances and other public events are given. It is located on the main square in the center of the city of Tehuacan. It is surrounded by greenery and there are places to sit and enjoy a nice day. There are many places around the park where you can buy food, snacks in the region, sweets and many things like that. Also in the downtown area of ​​the city there are also restaurants where you can enjoy delicious dishes in color and flavor. 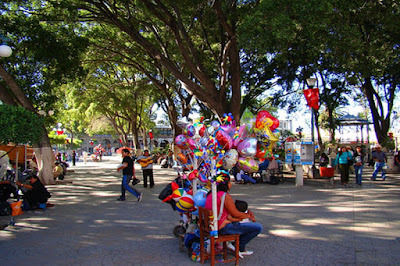 At the kiosk located in the center of the park becomes the Municipal Band and delights everyone with Mexican and classical music. The days that are presented at the kiosk are the Thursday night and Sunday at noon and in the afternoon. 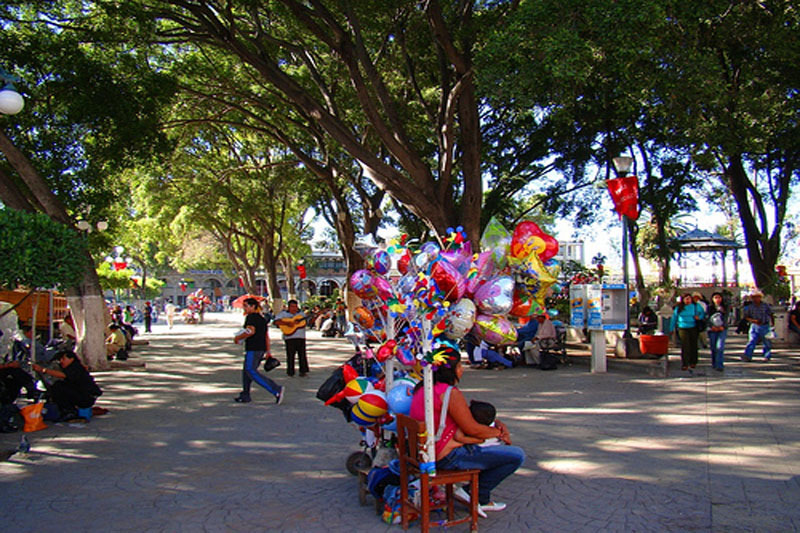 All tourist Tehuacan attend the downtown area to meet its main buildings and areas that characterize its inhabitants. That's why you should enjoy the things outdoors where you can learn more about the history and evolution of the city. It is a popular park that is located at a distance of 2 kilometers before reaching the city of Tehuacan. Their pools are mineral waters and because it is tourist attraction of the city due to the high popularity with the mineral waters of Tehuacan. The park consists of three large natural pools and streams whose waters are mineral water. One is Olympic-sized with diving pit and the other two have 2 meters deep with 3 slides and also has three wading pools for children can get without fear. The park has basketball courts, children's play area, dining rooms, bathrooms and large green areas where people can relax and sunbathe or enjoy their favorite drinks in the company of family and friends. In the cafeteria of the park you can buy food, soft drinks, water and other consumables. Also it is important to know that one of the elements that also attracts many people to the water park is that it has implemented additional services specially for those who want to try facial masks clay is extracted from the springs. The entrance fee to the park is individually and vary depending on people, the most expensive tickets are the general type. Children and elderly people are given a special discount. The costs are very economical and that is why the park has many tourist influx and the inhabitants of Tehuacan. It is an ideal family to visit where they can have access to pools and wading place on two levels. The park has a lake where you can fish. Note that to access the lagoon must pay a small amount to get permission to fish and if you can rent a boat for an hour to give a tour of the lagoon. If you want you can get food and drinks from the restaurant you are in the park in the center of wading services. There are also palapas and playgrounds. The green areas surrounding the entire park is for people who want to perform exercises or other recreational activities. There is also a fitness center, a snak bar, sports fields and camping area where if you want to camp must pay a fee to obtain the permit. For people who want to make trips in the park it is available bike rentals are per hour. Importantly, the park has a ballroom that can be rented. The attention of the staff working in the park provide them with excellent service. Parking is ample and safe. Then contact is present so you can go to enjoy a nice day at the Adventure Park. It is a water park that is ideal for the whole family. Has 1 pool semi-Olympic, 3 wading pools, 3 pools, bathrooms, area spits, palapas, shop, games, hall for conducting special events that can be rented, a restaurant-bar where you can enjoy delicious dishes, tennis sports, first aid area and extensive landscaping. The price to enter the park is really economic, also the park administration handles promotions and special discounts for students and staff to show their credentials IMSS weekday get a special discount. The hours are from 7:00 am to 6:00 pm. The municipal government of Tehuacan has always thinking about what children and recreation they should have. So he built a small zoo with the name "Baby Animals Club" where all children and adults can enjoy a good time there knowing the animals at the zoo. You can see a variety of animals like tigers, zebras, lions, crocodiles, lions, snakes, birds, pigs, llamas, monkeys and more. If you just want your kids to have fun in a safe place in the company of animals, should visit the club of animals found in Tehuacan. The hours are daily from 8:00 am to 7:00 pm. The entrance to the club costs are really economical. It is a place where cactus nurseries and a variety of species that can be seen in the botanical garden. People can visit from Monday to Sunday for most of the day. Here you can observe species such as agaves, garambullos, jasmine, sotolín and elephant foot. If you are a person who likes to enjoy nature and learn more about it, visit the botanical garden where the scenery is spectacular and it is all natural.